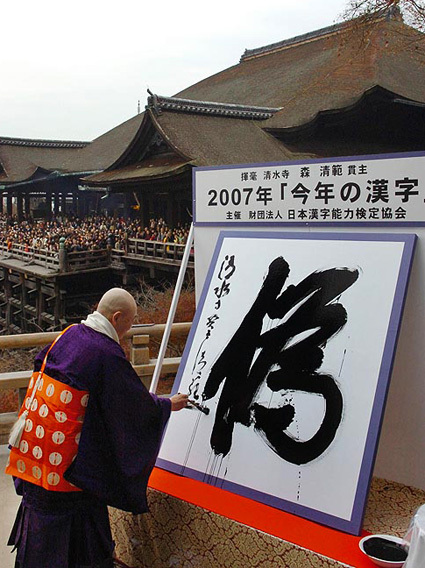 With a slew of food-related scandals throughout Japan, and the nation’s pension problems persisting, the kanji officially considered most apt for this year is that depicting ‘fake’. The newly chosen symbol, as tradition demands, carefully composed by a Buddhist monk. A profession that rather ironically is also frequently faked for money making purposes, with ‘beggars’ near stations and outside department stores often derided as dodgy. 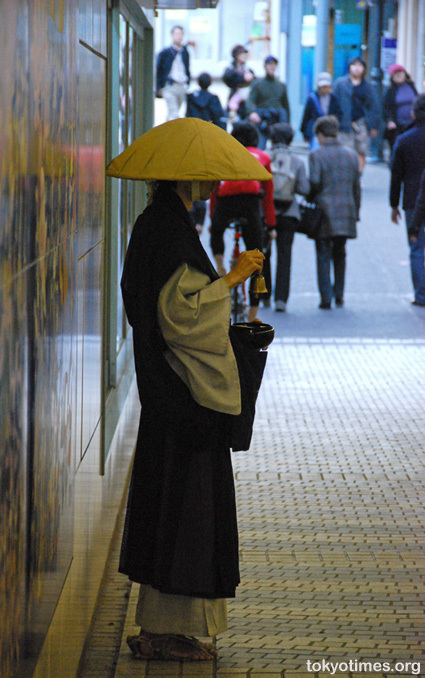 A friend of mine knew some gaijin monks in training, and claimed they earned about 60000 yen per day when they did this in Osaka. Sounds like a nice baito alternative! I have this thought often in the US about beggars. It always makes me suspicious when they have an m3 player plugged into their ears and are wearing Nike’s…. Very funny! I love that last photograph. However, there is a more serious side to the genuine practice of the monks. It has very little to do with making money, and everything to do with encouraging generosity within people, as “giving” is a key practice within Buddhism. It is considered highly auspicious to give offerings to those who are ordained, because they represent full devotion to the Buddha’s teachings; by giving to the monks, you are consciously manifesting right mind and dedication to the path within yourself. 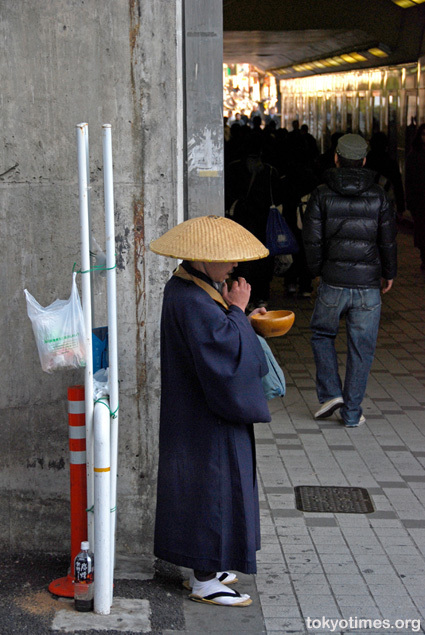 In other parts of Asia, less flushed with cash, it is more traditional for monks and nuns to be given servings of rice and other stables, known as alms, which they collect every morning from people. …and that is “staple”, not “stable”. In fact, even if you should give money to a “fake monk” or a genuine monk, it should neither matter one way or the other. As long as you are giving with right intention, the karmic result will be the same. That’s me done. Time for me to don my robes and head out to Tachikawa station. thats what i was trying to explain! I have been seeing this go on and on! I was beginning to wonder if these guys were for real especially the ones in the touristy (but not temple) places.